This 10.1" DVD Video Player with high resolution (1024 * 600) brings you amazing visual experience, which comes with 16:9 wide view angle display mode. With built-in high-quality DVD Driver, it&apos;s compatible with the most disc in the market. It&apos;s ideal for in-car use or home use with games functions and various ports which brings much fun on your boring journey. 10.1" TFT LED Display Screen with high resolution (1024 * 600) brings you amazing visual experience, which comes with 16:9 wide view angle display mode. Built-in 32-bit wireless games function, you can greatly enjoy your exciting games to kill time on your boring journey. It&apos;s compatible with DVD/ MP3/ DAT/ FLV/ DIVX/ VOB/ MP4/ XVID/ AVI/ 3GP/ RMVB. 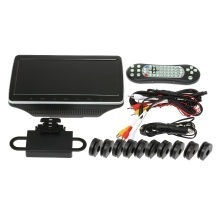 With USB 2.0 port, MS/ SD card slot, HD, AV, you can enjoy different ways of watching movies. There are two ways of power supply. You can connect it to the car cigarette lighter socket or use the 12V power at home which is ideal for both in-car use and home use. Easy installation in your car with accessories included. Easy install, easy to use. With built-in FM transmitter and IR transmitter, If you have other Digital Screens, the headrests can play the same games or the same movies when you connect them together by AV input and output cable, or they will work separately.